Stem: annual (perennial herb in south), of 1 kind, 30--180 cm, green; sheath 6--15 mm, longer than wide, generally with 1 dark band at tip, teeth 10--26, generally deciduous; branches 0. Sporangia: cone tip rounded. Ecology: Moist, sandy or gravelly areas; Elevation: < 3000 m. Bioregional Distribution: NW, CaRH, SN (exc Teh), GV, CW (exc SCoRI), SW, GB (exc Wrn), D; Distribution Outside California: to British Columbia, eastern United States. Synonyms: Equisetum fontinale Copel. ; Equisetum funstonii A.A. Eaton; Equisetum kansanum J.H. Schaffn. 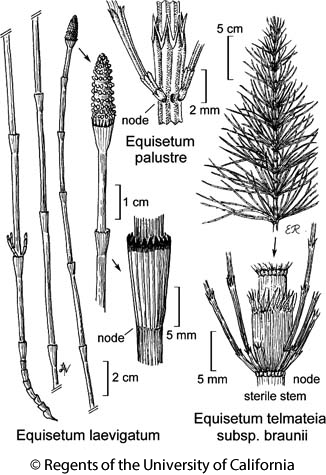 Citation for this treatment: Robert E. Preston & Richard L. Hauke 2012, Equisetum laevigatum, in Jepson Flora Project (eds.) Jepson eFlora, http://ucjeps.berkeley.edu/eflora/eflora_display.php?tid=24427, accessed on April 24, 2019. NW, CaRH, SN (exc Teh), GV, CW (exc SCoRI), SW, GB (exc Wrn), D; Markers link to CCH specimen records. Yellow markers indicate records that may provide evidence for eFlora range revision or may have georeferencing or identification issues. Purple markers indicate specimens collected from a garden, greenhouse, or other non-wild location.